California's Lost Coast is one of the state's least well-known wonderlands. Visitors from all over the world travel California Highway-1 hundreds of miles to see the state's spectacular cliffs and beaches - the Pacific Coast Highway in Southern California, the famous Big Sur route along the Central Coast, and the Shoreline Highway north of San Francisco. However in far northern California, north of Ft. Bragg, Highway-1 turns inland to rejoin US-101. The next northern section of coast, now called the Lost Coast, was deemed too rugged to build a highway. The mazes of steep mountain ranges and jagged cliffs here are penetrated by a handful of remote back roads, accessible only to those willing to make the long tedious drive. The reward is a spectacular landscape with beautiful, unspoiled beaches and very few people. 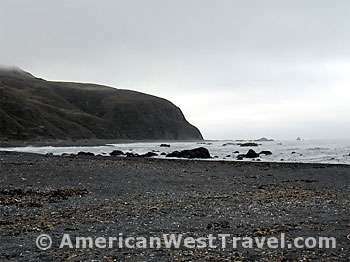 Most of the Lost Coast is designated wilderness, within the Sinkyone Wilderness State Park and the King Range National Conservation Area. The parks feature remote beaches backed up by steep cliffs and mountains. King's Peak reaches an elevation of 4,088 feet only three miles from the Pacific Ocean. The steep King Range has risen 66 feet in only the last 6,000 years. This is due to the meeting of three tectonic plates (North American, Pacific, and Juan de Fuca) just off the coast. The land on the North American plate is being piled rapidly upward. Its grey crumbly sandstone has created beaches of beautiful black sand. Sinkyone Wilderness State Park is accessed by remote and rugged dirt roads. It is a paradise for the determined backpacker. King Range National Conservation Area is accessed by paved roads at its southern and northern ends. One road reaches Shelter Cove at the southern tip where there are a variety of tourist services. 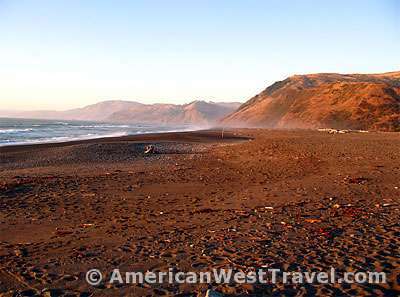 A spectacular loop road reaches Mattole Beach at the northern tip, where there is a small, primitive campground. Either way, it is slow and scenic going. 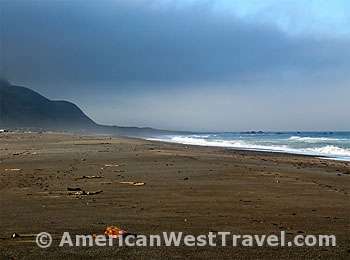 Our trip took the scenic loop road accessing Mattole Beach. 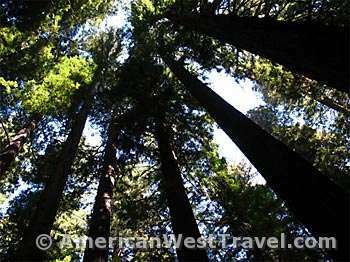 From the south, Mattole Road leaves US-101 in the heart of Humboldt Redwoods State Park, the largest of northern California's redwood preserves. The road heads west through the park's Roosevelt Grove. The route is shoulderless, narrow, and winding, so constructed to minimize the cutting of the ancient trees. 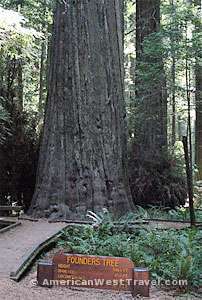 Often, a giant redwood will be right against the edge of the road, leaving no margin for error. It is not a recommended route for large RVs. After coming out of the redwood forest, Mattole Road starts to climb into the steep mountains. The road becomes a series of switchbacks, in and out of deep sections of forests. In the afternoons the sunlight can be blinding as you emerge from forest into open areas. After gaining the top of the mountain range, the descent on the other side into the valley of the Mattole River offers the route's slowest and most strenuous driving. It descends with a series of endless steep switchbacks, often with a posted speed limit of 10 MPH. It is necessary to ride the brake even in first gear. Meanwhile the spectacular vistas of mountains and valley are a constant distraction. You finally reach the Mattole River and cross a one-lane bridge into the hamlet of Honeydew. 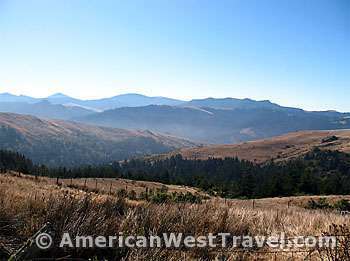 The road then winds along the Mattole River with many ups and downs. The Mattole is one of the few remaining free-flowing rivers (undammed) in the west, still supporting runs of salmon and steelhead trout. Eventually the turnoff to Mattole Beach, Lighthouse Road, reaches the coast in five uneventful miles. The climate change is dramatic. In the higher reaches of the mountains, late September temperatures hover around 90°F (32°C). The late afternoon temperature at the beach is 57°F (14°C) with a chilly wind. The Lost Coast does jut out into the ocean and is therefore quite exposed. It does experience the highest amount of rainfall in California, though mostly in the winter rainy season. However the reward here is a totally unspoiled place. 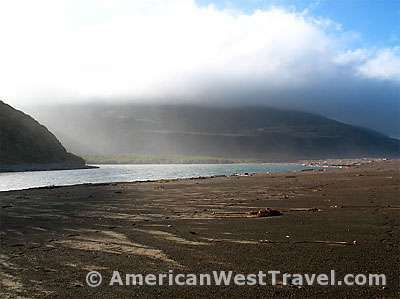 The primitive Mattole Beach Campground is separated from the beach only by a sand dune. Therefore you can access the beach any time of day (or night) with a short walk. The 15-unit campground is treeless; while you have no shelter from the wind, you do have great mountain backdrops on three sides. The beach is black sanded, and is open here. The Mattole River enters the ocean a few hundred yards to the north. To see beach backed by cliffs, you walk south into the King Range National Conservation Area. The abandoned Punta Gorda lighthouse is a few miles south. The beaches are utterly pristine and natural; no noise other than the surf. On our hike we saw only a couple passers-by. It is said that activity picks up on summer weekends. But this would consist largely of hikers and backpackers, not tourist crowds. The King Range does offer one of the few coastal wilderness-hiking experiences in the United States. In fact, the coast is accessible for 24 miles between Shelter Cove and Mattole Beach. The whole route is a considerable multi-day backpacking challenge featuring some boulder fields, stream crossing, and a few headlands that are impassable at high tide. Also, wildlife ranging from bears to rattlesnakes, as well as the opportunity to observe marine mammals ranging from seals to grey whales in season. 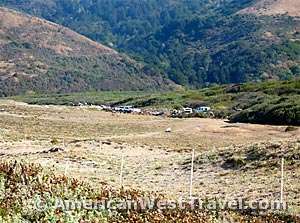 However the casual hike south from Mattole Beach is quite easy, save for the soft sand. There were several opportunities to observe tidal pools. Also, one cove featured the heads of many bobbing seals, perhaps fishing. A late walk on the beach offered a beautiful sunset. A brief 2:00am sojourn on a clear, moonless night featured a sky full of bright stars and a wonderful shooting star. We reluctantly leave Mattole Beach to continue on our loop trip. The route now becomes the Ferndale-Petrolia Road. It soon passes the village of Petrolia which features a general store and a post office. The road then drops down to the coast and follows it for a few miles. The flat, open area features a very rocky and craggy segment of coast with little sandy beach. It is mostly fenced-off private land but there are a few places to pull off the road to shoot photos. 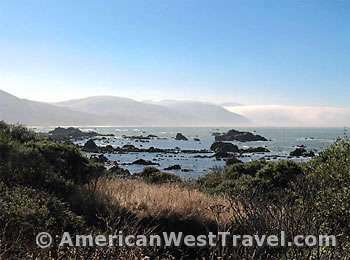 Before turning inland the route passes Cape Mendocino, the westernmost point in California. It then starts heading back into the mountains up an amazing grade known locally as The Wall, an 18% grade for one mile. A second steep grade up the Endless Hill brings you back into the mountains, first through rangeland with terrific views of mountain ranges, and then in and out of stands of thick woods. The remaining drive back to civilization at the Victorian town of Ferndale is fairly easy. From Ferndale, it's a flat and easy five-mile drive back to the US-101 freeway. From the US-101 exit in Humboldt Redwoods State Park to Mattole Beach, the distance is 42 miles, and it will take about two hours. From Mattole Beach to Ferndale, it's about 35 miles, and takes at least an hour. For those who enjoy self-punishment, the Tour of the Unknown Coast bicycle race covers this route every May. For more information, visit the BLM's King Range Website. Download a good printable map of Humboldt County and the Lost Coast. 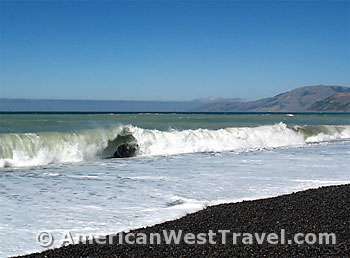 The Lost Coast and the King Range National Conservation Area is located about 230 miles north of San Francisco and 60 miles south of Eureka. All roads leading to the King Range are narrow, steep and winding. Allow PLENTY of time between destinations, have a full tank of gas, and be alert to oncoming traffic. All main roads are normally accessible to passenger cars except during heavy winter storms.